The oversized Hellboy hardcover series continues, collecting Mike Mignola and Richard Corben?s award-winning The Crooked Man story. Hellboy has racked up multiple Eisner Awards, numerous spinoffs, a prose line, video games, animated series, and two feature films. 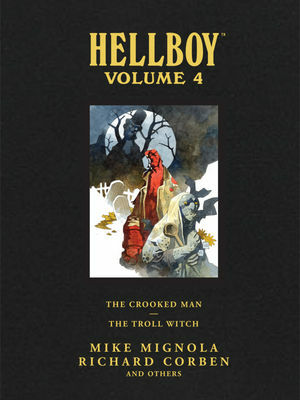 Hellboy Library Volume 4 collects two complete trade paperbacks full of short stories: The Troll Witch and Others and The Crooked Man, as well as an extensive selection of previously unreleased sketches and designs. * Collects Hellboy: The Troll Witch and Others, Hellboy: The Crooked Man, and over 30 pages of new sketchbook material.